Lennox-Gastaut syndrome (LGS), or childhood epileptic encephalopathy, is a pediatric epilepsy syndrome characterized by multiple seizure types; mental retardation or regression; and abnormal findings on electroencephalography (EEG). See the image below. 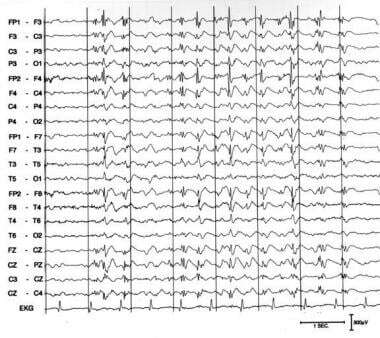 Slow spike wave pattern in a 24-year-old awake male with Lennox-Gastaut syndrome. The slow posterior background rhythm has frequent periods of 2- to 2.5-Hz discharges, maximal in the bifrontocentral areas, occurring in trains as long as 8 seconds without any clinical accompaniment. Average intelligence quotient (IQ) score is significantly lower in patients with symptomatic LGS than in those with cryptogenic LGS. Earlier age of seizure onset is correlated with higher risk of cognitive impairment. Findings on general physical examination are normal in many cases. No physical findings are pathognomonic for LGS. Nevertheless, the general physical examination can help identify specific etiologies that have both systemic and neurologic manifestations. No laboratory investigations are known to aid in the diagnosis of LGS. Dietary therapies, including the ketogenic diet and modified Atkins diet—involving a high ratio of fats (ketogenic foods) to proteins and carbohydrates (antiketogenic foods)—may be useful in patients with LGS refractory to medical treatment. Childhood epileptic encephalopathy, or Lennox-Gastaut syndrome (LGS), is a devastating pediatric epilepsy syndrome constituting 1-4% of childhood epilepsies. The syndrome is characterized by multiple seizure types; mental retardation or regression; and abnormal findings on electroencephalogram (EEG), with paroxysms of fast activity and generalized slow spike-and-wave discharges (1.5-2 Hz). The most common seizure types are tonic-axial, atonic, and absence seizures, but myoclonic, generalized tonic-clonic, and partial seizures can be observed (see Clinical Presentation). An EEG is an essential part of the workup for LGS. Neuroimaging is an important part of the search for an underlying etiology (see Workup). A variety of therapeutic approaches are used in LGS, ranging from conventional antiepileptic agents to diet and surgery (see Treatment and Management). Unfortunately, much of the evidence supporting these approaches is not robust, and treatment is often ineffective. The pathophysiology of LGS is not known. No animal models exist. A variety of possible pathophysiologies have been proposed. One hypothesis states that excessive permeability in the excitatory interhemispheric pathways in the frontal areas is present when the anterior parts of the brain mature. Involvement of immunogenetic mechanisms in triggering or maintaining some cases of LGS is hypothesized. Although one study found a strong association between LGS and the human lymphocyte antigen class I antigen B7, a second study did not. No clear-cut or homogeneous metabolic pattern was noted in 2 separate reports of positron emission tomography (PET) studies in children with LGS. LGS can be classified according to its suspected etiology as either idiopathic or symptomatic. Patients may be considered to have idiopathic LGS if normal psychomotor development occurred prior to the onset of symptoms, no underlying disorders or definite presumptive causes are present, and no neurologic or neuroradiologic abnormalities are found. In contrast, symptomatic LGS is diagnosed if a likely cause can be identified as being responsible for the syndrome. There is a history of infantile spasms in 9-39% of LGS patients. In addition to idiopathic and symptomatic LGS, some investigators add “cryptogenic” as a third etiologic category. This category encompasses cases in which the epilepsy appears to be symptomatic but a cause cannot be identified. In an epidemiologic study in Atlanta, Georgia, 44% of patients with LGS were in the cryptogenic group. In a series of 23 patients with cryptogenic LGS, 2.5-47.8% had a family history of epilepsy and febrile seizures. In the revision of the classification of seizures and epilepsy published in 2010, the terms "idiopathic," "symptomatic," and "cryptogenic" were eliminated and replaced by "genetic," "structural/metabolic," and "unknown" to encourage focus on specific underlying mechanisms. However, many neurologists continue to use those terms as described above. Overall, LGS accounts for 1-4% of patients with childhood epilepsy but 10% of patients with onset of epilepsy when younger than 5 years. The prevalence of LGS in Atlanta, Georgia, was reported as 0.26 per 1000 live births. LGS is more common in boys than in girls. The prevalence is 0.1 per 1000 population for boys, versus 0.02 per 1000 population for girls (relative risk, 5.31). The mean age at epilepsy onset is 26-28 months (range, 1 d to 14 y). The peak age at epilepsy onset is older in patients with LGS of an identifiable etiology than in those whose LGS has no identifiable etiology. The difference in age of onset between the group of patients with LGS and a history of West syndrome (infantile spasm) and those with LGS without West syndrome is not significant. The average age at diagnosis of LGS in Japan was 6 years (range, 2-15 y). Among children with intellectual disability, 7% have LGS, while 16.3% of institutionalized patients with intellectual disability have LGS. Patients with symptomatic LGS, particularly those with an early onset of seizures, prior history of West syndrome, higher frequency of seizures, or constant slow EEG background activity, have a worse prognosis than those with idiopathic seizures. The characteristic diffuse slow spike wave pattern of LGS gradually disappears with age and is replaced by focal epileptic discharges, especially multiple independent spikes. Mortality rate is reported at 3% (mean follow-up period of 8.5 y) to 7% (mean follow-up period of 9.7 y). Death often is related to accidents. A high rate of injuries is associated with atonic and/or tonic seizures. The severity of the seizures, frequent injuries, developmental delays, and behavior problems take a large toll on even the strongest parents and family structures. Pay attention to the psychosocial needs of the family (especially siblings). The proper educational setting also is important to help the patient with LGS reach his or her maximal potential. Trevathan E, Murphy CC, Yeargin-Allsopp M. Prevalence and descriptive epidemiology of Lennox-Gastaut syndrome among Atlanta children. Epilepsia. 1997 Dec. 38(12):1283-8. [Medline]. Arzimanoglou A, French J, Blume WT, Cross JH, Ernst JP, Feucht M, et al. Lennox-Gastaut syndrome: a consensus approach on diagnosis, assessment, management, and trial methodology. Lancet Neurol. 2009 Jan. 8(1):82-93. [Medline]. [Full Text]. Engel J Jr; International League Against Epilepsy (ILAE). A proposed diagnostic scheme for people with epileptic seizures and with epilepsy: report of the ILAE Task Force on Classification and Terminology. Epilepsia. 2001 Jun. 42(6):796-803. [Medline]. Berg AT, Berkovic SF, Brodie MJ, Buchhalter J, Cross JH, van Emde Boas W, et al. Revised terminology and concepts for organization of seizures and epilepsies: report of the ILAE Commission on Classification and Terminology, 2005-2009. Epilepsia. 2010 Apr. 51 (4):676-85. [Medline]. Heiskala H. Community-based study of Lennox-Gastaut syndrome. Epilepsia. 1997 May. 38(5):526-31. [Medline]. Oguni H, Hayashi K, Osawa M. Long-term prognosis of Lennox-Gastaut syndrome. Epilepsia. 1996. 37 Suppl 3:44-7. [Medline]. Ohtsuka Y, Amano R, Mizukawa M, Ohtahara S. Long-term prognosis of the Lennox-Gastaut syndrome. Jpn J Psychiatry Neurol. 1990 Jun. 44(2):257-64. [Medline]. Bare MA, Glauser TA, Strawsburg RH. Need for electroencephalogram video confirmation of atypical absence seizures in children with Lennox-Gastaut syndrome. J Child Neurol. 1998 Oct. 13(10):498-500. [Medline]. Al-Banji MH, Zahr DK, Jan MM. Lennox-Gastaut syndrome. Management update. Neurosciences (Riyadh). 2015 Jul. 20 (3):207-12. [Medline]. van Rijckevorsel K. Treatment of Lennox-Gastaut syndrome: overview and recent findings. Neuropsychiatr Dis Treat. 2008 Dec. 4(6):1001-19. [Medline]. [Full Text]. Conry JA, Ng YT, Paolicchi JM, Kernitsky L, Mitchell WG, Ritter FJ, et al. Clobazam in the treatment of Lennox-Gastaut syndrome. Epilepsia. 2009 May. 50(5):1158-66. [Medline]. Ng YT, Collins SD. Clobazam. Neurotherapeutics. 2007 Jan. 4(1):138-44. [Medline]. Ng YT, Conry JA, Drummond R, Stolle J, Weinberg MA. Randomized, phase III study results of clobazam in Lennox-Gastaut syndrome. Neurology. 2011 Oct 11. 77(15):1473-1481. [Medline]. Feucht M, Brantner-Inthaler S. Gamma-vinyl-GABA (vigabatrin) in the therapy of Lennox-Gastaut syndrome: an open study. Epilepsia. 1994 Sep-Oct. 35(5):993-8. [Medline]. You SJ, Kang HC, Kim HD, Lee HS, Ko TS. Clinical efficacy of zonisamide in Lennox-Gastaut syndrome: Korean multicentric experience. Brain Dev. 2008 Apr. 30(4):287-90. [Medline]. Motte J, Trevathan E, Arvidsson JF, Barrera MN, Mullens EL, Manasco P. Lamotrigine for generalized seizures associated with the Lennox-Gastaut syndrome. Lamictal Lennox-Gastaut Study Group. N Engl J Med. 1997 Dec 18. 337(25):1807-12. [Medline]. Glauser TA. Topiramate. Epilepsia. 1999. 40 Suppl 5:S71-80. [Medline]. Sachdeo RC, Glauser TA, Ritter F, Reife R, Lim P, Pledger G. A double-blind, randomized trial of topiramate in Lennox-Gastaut syndrome. Topiramate YL Study Group. Neurology. 1999 Jun 10. 52(9):1882-7. [Medline]. Pellock JM. Felbamate. Epilepsia. 1999. 40 Suppl 5:S57-62. [Medline]. Glauser T, Kluger G, Sachdeo R, Krauss G, Perdomo C, Arroyo S. Rufinamide for generalized seizures associated with Lennox-Gastaut syndrome. Neurology. 2008 May 20. 70(21):1950-8. [Medline]. Kluger G, Kurlemann G, Haberlandt E, Ernst JP, Runge U, Schneider F, et al. Effectiveness and tolerability of rufinamide in children and adults with refractory epilepsy: first European experience. Epilepsy Behav. 2009 Mar. 14(3):491-5. [Medline]. Perucca E, Cloyd J, Critchley D, Fuseau E. Rufinamide: clinical pharmacokinetics and concentration-response relationships in patients with epilepsy. Epilepsia. 2008 Jul. 49(7):1123-41. [Medline]. Wheless JW, Isojarvi J, Lee D, Drummond R, Benbadis SR. Clobazam is efficacious for patients across the spectrum of disease severity of Lennox-Gastaut syndrome: Post hoc analyses of clinical trial results by baseline seizure-frequency quartiles and VNS experience. Epilepsy Behav. 2014 Oct 2. 41C:47-52. [Medline]. Ferrie CD, Patel A. Treatment of Lennox-Gastaut Syndrome (LGS). Eur J Paediatr Neurol. 2009 Nov. 13(6):493-504. [Medline]. Lerner JT, Salamon N, Sankar R. Clinical profile of vigabatrin as monotherapy for treatment of infantile spasms. Neuropsychiatr Dis Treat. 2010 Nov 8. 6:731-40. [Medline]. [Full Text]. Ohtsuka Y, Yoshinaga H, Shirasaka Y, Takayama R, Takano H, Iyoda K. Rufinamide as an adjunctive therapy for Lennox-Gastaut syndrome: A randomized double-blind placebo-controlled trial in Japan. Epilepsy Res. 2014 Nov. 108(9):1627-36. [Medline]. Banzel (rufinamide) [package insert]. Woodcliff Lake, NJ: Eisai Inc. 2/2015. Available at [Full Text]. Lowes R. Clobazam (Onfi) can cause serious skin reactions, FDA warns. Medscape Medical News. December 3, 2013. Available at http://www.medscape.com/viewarticle/815303. Accessed: December 8, 2013. FDA Drug Safety Communication. FDA warns of serious skin reactions with the anti-seizure drug Onfi (clobazam) and has approved label changes. December 3, 2013. Available at http://www.fda.gov/Drugs/DrugSafety/ucm377204.htm. Accessed: December 8, 2013. Cukiert A, Burattini JA, Mariani PP, Câmara RB, Seda L, Baldauf CM, et al. Extended, one-stage callosal section for treatment of refractory secondarily generalized epilepsy in patients with Lennox-Gastaut and Lennox-like syndromes. Epilepsia. 2006 Feb. 47(2):371-4. [Medline]. Ben-Menachem E, Hellström K, Waldton C, Augustinsson LE. Evaluation of refractory epilepsy treated with vagus nerve stimulation for up to 5 years. Neurology. 1999 Apr 12. 52(6):1265-7. [Medline]. Lancman G, Virk M, Shao H, Mazumdar M, Greenfield JP, Weinstein S, et al. Vagus nerve stimulation vs. corpus callosotomy in the treatment of Lennox-Gastaut syndrome: a meta-analysis. Seizure. 2013 Jan. 22 (1):3-8. [Medline]. Neal EG, Chaffe H, Schwartz RH, Lawson MS, Edwards N, Fitzsimmons G, et al. The ketogenic diet for the treatment of childhood epilepsy: a randomised controlled trial. Lancet Neurol. 2008 Jun. 7(6):500-6. [Medline]. Freeman JM, Vining EP, Kossoff EH, Pyzik PL, Ye X, Goodman SN. A blinded, crossover study of the efficacy of the ketogenic diet. Epilepsia. 2009 Feb. 50(2):322-5. [Medline]. De Los Reyes EC, Sharp GB, Williams JP, Hale SE. Levetiracetam in the treatment of Lennox-Gastaut syndrome. Pediatr Neurol. 2004 Apr. 30(4):254-6. [Medline].